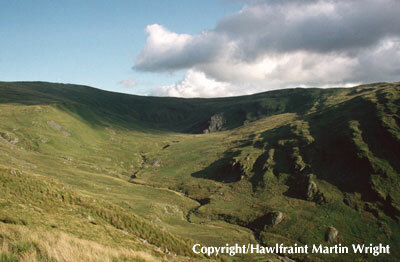 The rocks of the Cambrian Mountains provide the framework and backcloth for the unique landscape, society, wildlife and history of the Cambrian Mountains. In addition their direct exploitation has had considerable local impacts. The rocks of the Cambrian Mountains were laid down 500-400 million years ago, and consist of marine sedimentary rocks, which were deformed by earth movements, resulting in the folding of the rocks, which can be clearly appreciated on the ground in such locations as Pumlumon. Older Ordovician rocks outcrop along the south-eastern edge of the Cambrian Mountains, whilst the rest of the area is composed mainly of Silurian rocks. Fossils from Mid Wales dating from the Silurian period helped more than a century ago to unravel the time sequence of rocks in Wales and to establish principles now applied globally. The mineral veins (lead, zinc, copper and silver) of North Ceredigion and North-West Powys were formed 390 to 220 million years ago, during phases of hydrothermal activity. One of the most significant events to affect the landscape was a series of ice ages. The first of these started around 2.4 million years ago, but the most recent ended only 12,000 years ago. During these periods, the Cambrian Mountains were covered by a deep sheet of ice, several thousand feet thick, large ice-caps formed on the Welsh mountains, and glaciers occupied the valleys. The glaciers carved deeply into the rocks to give the landscape its now familiar appearance. Pumlumon is a fine example of a landscape sculpted by glacial ice; Llyn Llygad Rheidol on the north slope of Pumlumon is a moraine-dammed lake occupying a corrie gouged out by ice, and the Elan & Claerwen valleys also owe their origins to this period. The Cambrian Mountains, partly because of the uniform character of their rocks, appear as a dissected plateau broken only by glacial gouging and by the deep clefts of the river valleys. The spectacular gorge and waterfall at Dylife was formed by the deep-cutting headward erosion of the Twymyn-Dyfi to capture the uppermost Clywedog-Severn valley. Similarly, the Teifi was first diverted by rapid headward erosion of the river Ystwyth along the line of the Ystwyth fault, and then the Ystwyth headwaters in turn were captured by the Rheidol. The shortened route to the sea from Devils Bridge (10 miles compared with the previous 50 miles to reach the coast at Cardigan) caused the Rheidol to deepen its bed very rapidly, creating the famous waterfall and gorge at Devil’s Bridge.